Apple, Google parent company Alphabet and a number of established car makers are reportedly on the hunt for prime real estate in the San Francisco Bay Area to serve their respective autonomous vehicle projects, with Apple in particular said to be looking at an 800,000-square-foot plot. 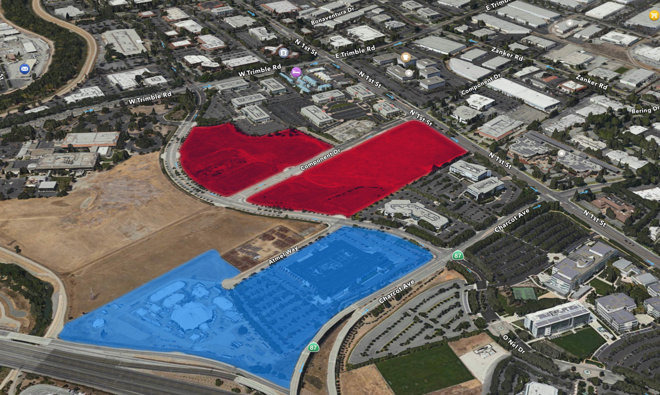 Apple's undeveloped 43-acre plot in San Jose (red) sits across from the 101 Tech campus (blue), where it leases 300,000 square-feet of office space. During Hudson Pacific Properties's quarterly earnings call on Thursday, CEO Victor Coleman said his company is seeing a "definitive movement" from self-driving cars and research and development facilities, reports The Wall Street Journal. The comments referenced concerns of Silicon Valley real estate demand amid a perceived slowdown in tech sector growth. "We're seeing the Toyotas of the world, the Teslas of the world, BMWs, Mercedes. Ford now is out in the marketplace looking for space," Coleman said. "I haven't even mentioned the 400,000 square feet that Google's looking to take down and the 800,000 square feet that Apple's looking to take down for their autonomous cars as well." The supposed plots are small in comparison to standard car manufacturing plants, including a roughly 5.3 million-square-foot facility operated by electric car pioneer Tesla. Even Apple's own Campus 2 headquarters comes in at around 2.8 million square feet, eclipsing the footprint of the rumored 800,000-square-foot lot mentioned in today's report. However, Apple is indeed said to be mulling a "Project Titan" expansion, one that could involve the construction of facilities dedicated to R&D and potentially pilot manufacturing. AppleInsider sources in September revealed the company was investigating development potential of a recently purchased site in San Jose. The 43-acre plot currently boasts nearly 2 million square feet of office space that could be converted into an automotive center.